This is one of 25 new models that we have in stock. The BN0035SLBRG is one of my personal favourites along with a very similar model BN0035BKBRG. This model features a brushed steel dial with the hour markers, cogs and components being outlined in black. That said brief notes of yellow and red also feature in the composition of the dial. The outer case is a mix of brushed steal and high polished steel with slightly accentuated chronograph buttons and crown adding a real modern twist on a classic design. The watch not only brings flawless design but also an abundance of practicality with the fully functional chronograph, date display window and its water resistance of up to 5ATM. 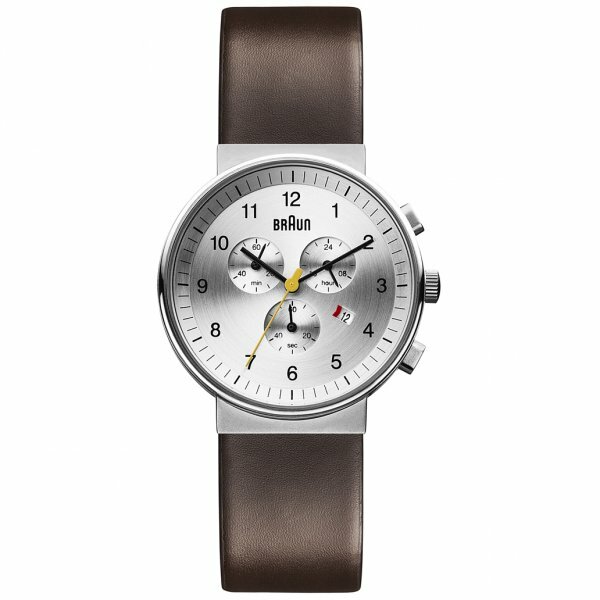 The brown genuine leather strap finishes the whole thing off beautifully. We are official stockists of Braun Watches, so this BN0035SLBRG comes with a 2 year manufacturer’s warranty.